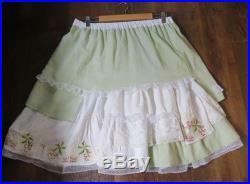 Mori girl Light Green Forest Skirt. Handmade. 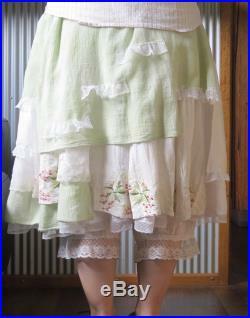 Sweet light green mori girl handmade layered skirt with vintage, repurposed and new fabrics. Australian size 8-14this skirt can be worn in any direction. This skirt is soft and comfortable as well as beautiful to wear. You can wear this skirt on its own, with bloomers or with another skirt underneath for that extra layered mori girl look. 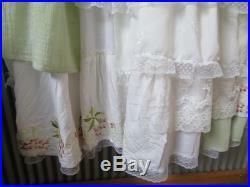 I have handsewn this skirt using new 100% cotton under and a mixture of cotton, vintage fabric and lace. 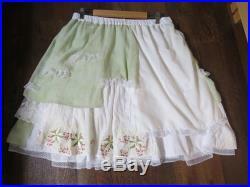 It has sewen and tattered edges for a cute shabby look, and a nice soft elastic waistband for comfort. You will love wearing this skirt.